iDEA has developed a Record of Achievement on the platform. This enables learners at any point in their learning experience to download, print and share their iDEA achievements to date. How can I use it if I am an iDEA student? You can download, print and share your achievements as often as you like before or after you get your Award. This means you will be able to showcase your hard work in a verifiable certificate whether you have earned two badges or fifty badges. This is particularly useful for job seekers, apprentices, students and anyone making a personal statement for an application, going to an interview, or needing to prove what they’ve accomplished. You can use your Record of Achievement to demonstrate the skills, information and knowledge you have gained at both Bronze and Silver level. Just go to your 'completed badges' section on the Badge Store. How can I validate it if I am an employer or educational institution? iDEA has created a personal verification number for each and every participant so that when they share their Record of Achievement, iDEA can validate their progress to date with any future employer or learning institution who requires verification. Just input the verification number into the box below or click the link if someone sends it to you. 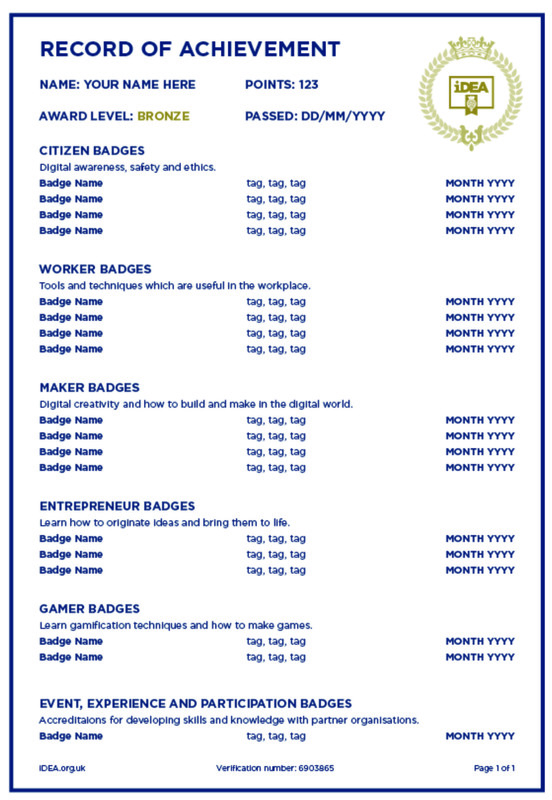 All online modules on iDEA (known as ‘badges’) have meta-data which helps you see the sorts of skills, information and knowledge a person has acquired on each module.